My October started with a judging at the Cathay Pacific Hong Kong International Wine & Spirit Competition (CX HKIWSC). This is the fifth year of the competition and my fourth as a judge. I ran the back room logistics in the first year during my holiday in Hong Kong and afterwards Simon Tam offered me a job at Independent Wine Centre, which ended my years of wandering around the world and brought me back to Hong Kong. Because of this, the competition will always be something special to me. More importantly, it is the community spirit that I treasure. Even though we may be tasting some interesting and good wines, we still need support, jokes and laughter to get through over 400 wines in four days! I have had some experience (nowhere near as much as some other judges though) in other international competitions, but the CX HKIWSC certainly has the best vibe. There are many different formats of judging. In some, the panel of judges sits together around a table, waiting for each other to finish a small flight, then briefly discusses it. This can put pressure on some judges who are slower. In others, judges score individually and there are no discussions in the panels so there may be errors where judges misread a wine. It also doesn’t allow the less experienced judges to learn from others. What I like about the CX HKIWSC is that each judge scores a flight of about 30-50 wines at his own pace, then the panel gathers to discuss those that have a wide range of scores. Judges debate and re-taste those wines until a consensus is reached. Moreover, judges are rotated everyday for a better learning experience. This method does not have the shortfalls of the others and also fosters a team spirit among the judges. The most interesting part of this competition is the food/wine pairing judging. It started off with only four Chinese dishes (braised abalone, Peking duck, dim sum and kung pao chicken) and has now extended to cover 10 dishes from four countries (the new dishes are sashimi, shrimp tempura, beef teppanyaki, yakitori grilled chicken, pad Thai and chicken tikka). I think this sends a very important message to consumers that wine can indeed go with Asian food—not only delicacies like abalone and sashimi but also everyday food like dim sum and pad Thai. We Asians don’t drink a lot of wine because we do not yet have the culture and we tend to think that wine only goes with western cuisines or expensive banquets. Pairing wine and everyday food will help us develop our own wine culture and eventually expand the market. Unfortunately, however, this potentially powerful message has yet to be communicated effectively to consumers. I really wish that both the organisers (sorry Debra) and the winners could do more to spread the word. The most educational part of the competition is 'Test Your Palate'. CX HKISWC is the first competition to open its doors to the public at the end of judging each day so people can taste the diverse styles of wine of various grape varieties from different countries. And what’s more, they can ask judges face-to-face anything they want to know about wine. This is a great learning experience and a wonderful opportunity for wine lovers to compare and contrast — you have to admit that no one in their right mind would open 10 different bottles of wine in one go just to try. At Test Your Palate, there are over 400 wines available every evening! What is even better is that there is a ‘fault’ table carrying wines rejected by judges during that day. Consumers can taste what is really meant by 'reduced', 'oxidised' and 'corked'. Test Your Palate has been running for three years now. In the first two years guests were mostly wine students, but this year it was pleasing to see a more general range of consumers, showing that the event is becoming better known. I even saw some of my secondary school friends, a few of whom I hadn’t seen since graduation! But the best of the best has to be the dinners. Sarah, one of the panel chairs, always spoils us with her wines—not the most expensive ones but lesser-known and truly interesting. Of course, there are always a few bottles that our judges bring from their home countries. This year, Chinese wines were a constant fixture on table, thanks to Christian! Wine competitions are about rating wine for average consumers and giving them guidance in this complex world of wine. CX HKIWSC is doing a good job for the Hong Kong consumer. Next time, pick a bottle of wine with a CX HKIWSC medal, and especially try the food/wine pairing winning wines. Check out the 2013 competition results here. What a memorable dinner: pairing Chinese food with a whole range of Lustau sherries, from Manzanilla to PX (Pedro Ximénez)! Sherry, long viewed as an out-of-fashion drink for old ladies, is making a comeback. Trendy sherry bars frequented by equally fashionable young consumers are sprouting in London, and sherry cocktails are gaining in popularity. But it's not just an aperitif or dessert wine. Sherry is in fact popular with food, especially tapas in Spain, and rightly so. The 'discovery' of how well it pairs with Chinese cuisine is good news for winos and foodies alike. Most Chinese food is robust and its intense flavours can kill even some of the boldest red wines. Pairing wines with dishes perceived to be lighter, like seafood or chicken, can also sometimes be tricky. 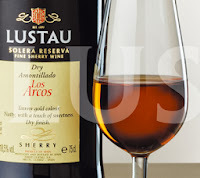 Sherry, on the other hand, is highly versatile, thanks to its many styles (see below). The fino style is light on the palate but its 15-16% alcohol balances well with deep fried dishes. Its savoury and tangy aromas compliment the food, unlike some very fruity wines whose opulent fruit actually clashes with it. The heavier oloroso style, 18-20% alcohol, is weighty enough to stand up to heavily braised dishes, while its sweeter style is perfect with the generally sweeter Shanghainese cuisine. This reminded me of the port and food pairing experience. Like sherry, port is a sweet fortified wine but supported by high acidity. It stands up well against the powerful fatty Northern Chinese cuisine. Indeed, a tawny port is a fine complement to hairy crab. 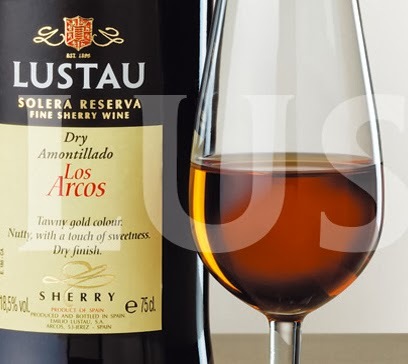 Ingnacio López de Carrizosa, the Export Director of Lustau, reckons the Amontillado style sherry, with its oxidised aromas not dissimilar to Chinese yellow wine, is also a perfect pairing with hairy crab, and I couldn’t agree more. Both the port and the sherry have a similar intensity to the crab. It is then up to the diner whether they prefer the sweeter tawny or the drier Amontillado. By the way, there is also a sweeter style Amontillado. Lustau Puerto Fino Sherry Reserva with deep fried scallops and crab meat. OK, this was slightly westernised as the crab meat was mixed with cheese, but still it was delicious. The wine was dancing on the palate after the food rather than being overpowered by it. Lustau Dry Amontillado Los Arcos Reserva with crisp baby pigeon. Although I felt sorry for the tiny pigeon, its tender yet powerful flavour was the perfect complement to the nutty and smoky Amontillado. Lustau VORS 30 year old Palo Cortado with beef fried rice and black truffle. The intense truffle provided a nice contrast against the sweet-bitterness of the wine. So next time don’t be afraid to experiment with innovative food and wine matching ideas. From champagne to fortified wine, there is always a dish (or more) to match! Lustau wine is available from ASC Fine Wines. Fino: Biological maturation with a layer of yeast on top called 'flor', which prevents the wine from oxidising, results in unique acetaldehyde aromas (tangy, salty, herby) at about 15% alcohol. Pale colour, fresh and does not improve in bottle (so consume as soon as possible). Manzanilla: Fino sherry matured in the town of Sanlúcar de Barrameda, close to the Atlantic Ocean. The flor is thicker. It has a more intense tangy seaweed aroma and a more linear and lighter palate. Oloroso: Oxidation maturation, ie. through contact with air. No flor layer. Brown colour with aromas of toffee, walnuts, prunes and spices. 18-20% alcohol. Can be dry or sweet. Amontillado: Starts its life as Fino but is deliberately refortified to kill the flor and then continues to mature by oxidation, like Oloroso. Delicate aromas of both fino and oloroso. Can be dry or sweet. Palo Cortado: Similar to Amontillado but the flor dies naturally rather than being killed deliberately. Similar characteristics to Amontillado but heavier as it is usually aged for a much longer time. A rare wine. Pedro Ximénez: Opaque brown colour, intensely rich and sweet with 400-500 g/l sugar. Toffee, rancio, raisin, liquorice aromas. I always say that learning about wine is never-ending—the more I learn, the less I seem to know because I keep discovering new things in the process. This has just been proved right yet again. I thought I knew quite a bit about South African wine, but I learnt something new at the recent South African masterclass led by Neil Grant, the Founder and Chairman of the South African Sommelier Association. I even received a certificate after the tasting! 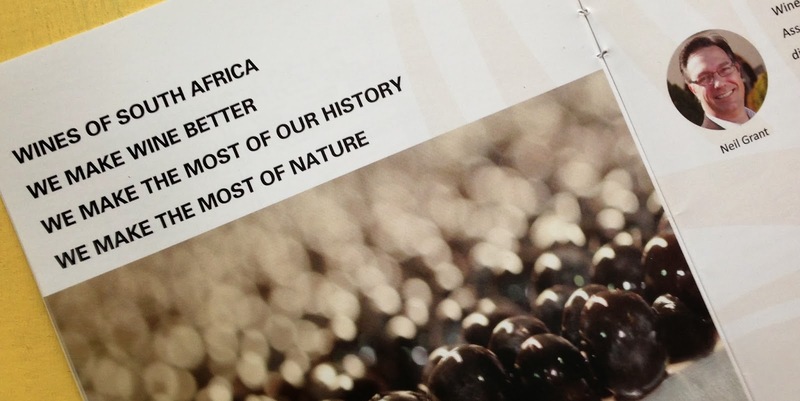 Although South Africa has some 350 years of winemaking history, the modern wine industry only began in 1994 after apartheid when winemakers sought to catch up with the rest of the world in terms of viticultural practices, new techniques and investment. South African wine has a unique position between Old and New World—Old World style but with the ripe fruit of the New World. South Africa has more sunshine than most Old World wine regions so the fruit will always be riper but the wine always tend to be earthier and drier, more akin to the Old World style rather than the overtly ripe fruit character of the New World. South African winemakers want to learn from others, but they don’t want to copy them. Take Sauvignon Blanc for example. Neil reckons South African Sauvignon Blanc tends more towards citrus and lime characters rather than the tropical fruit and guava fingerprint of New Zealand’s. It is closer to Sancerre but without the prominent grassy aroma. Pinotage is an example of good learning. It is a South African grape but nevertheless there are small plantings in Australia, New Zealand and the US. South African winemakers learnt from the Kiwis to plant Pinotage in cooler areas and to pick the grapes earlier. The result is a more elegant style with more traces of Pinot Noir, one of the parents of Pinotage. We tasted the pleasant Warwick Estate ‘Old Bush Vines’ Pinotage 2010 but Neil reckoned the 2011 vintage is an even better illustration of the lighter style. Some consumers associate South African wine with a burnt rubber smell. The University of Stellenbosch did some research on this a few years ago but there were no conclusive findings as to what might be the cause—the varieties, disease, winemaking or hygiene. I also had a discussion with a few South African winemakers some time ago and each had a different opinion. Neil thinks we should take ‘burnt rubber’ as a positive term; it may well be the South African terroir. I fully agree with this. For some reason we have put a negative mark on ‘burnt rubber’ even though some people actually like it. In fact, guests at the tasting agreed that the ‘burnt rubber’ is less obvious now in today’s wines, and even when they do have it it is more pleasant than before. I think it is time for us to throw this negative stigma away. Make the most of the Cape Winelands. Keep it up, South African fellas!